We all love a brand new, sparkling, shiny guitar. The problem is that the look just doesn’t last. After a few weeks of playing, what was once a smooth, beautiful body starts to collect fingerprints, dust and even scratches. You can wipe them away to some extent, but the dazzle remains diminished. Unless that is, you have a decent guitar polish to hand. These purpose-made products help to revive your guitar’s sparkle. A lot of them are even suited to matte bodies, enabling your guitar to look as smooth as the day you took it home for the first time. 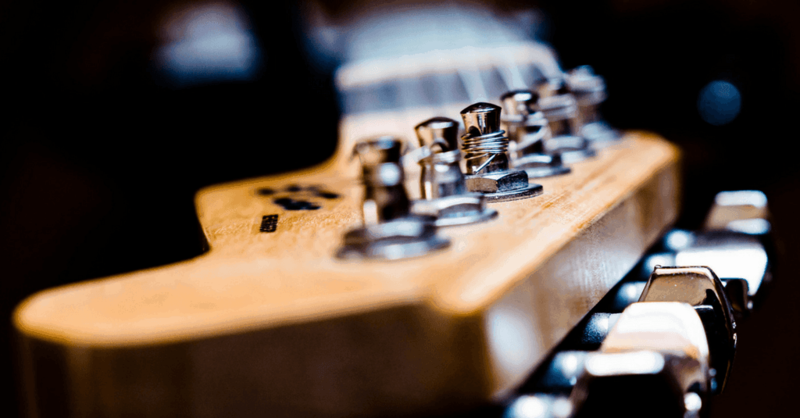 We went on a search to find the best guitar polish – this article is our findings. Here we’re just focusing on guitar polish products. So here are, in our opinion, the best guitar polish products on the market today. Proper care and attention via cleaning and polishing, along with keeping humidity levels at a sensible level, will vastly improve the longevity of your guitar; and not only that, it will play and sound better. Polishing will preserve your guitar’s life as it prevents dust and dirt from damaging both the aesthetics and, potentially, the electrics. Removing dust from your instrument regularly will ensure that it doesn’t get trapped anywhere it shouldn’t while using polish on the body and fretboard will help to keep it from unnecessary signs of aging. Not only will your guitar last longer when you take good care of it, but it will continue to look new, well into its life. Secondly, the playing experience is undoubtedly smoother on a well-maintained guitar. Polish that’s designed to treat the fretboard and remove any unwanted grime or dust will keep your fingers running across it smoothly and ensure that everything sounds just as it should. The easiest time to do this maintenance is when you’re changing the strings – and remember to treat it with fretboard oil every so often to ensure the essential oils don’t run out. There are a few things to consider before you rush out and buy the first bottle of polish you see. Not all polishes are suited to all woods. Some are designed to work with lacquer, some work with acoustic guitars made of fine woods and some are versatile and will suit pretty much anything. Some polishes that are designed to prolong shine contain harmful chemicals that can damage a guitar that’s made of delicate wood. Some can even end up dampening the sound of the guitar as they build up over time. Most of these polishes will say on the bottle which woods they are suitable for use with, so if yours isn’t on the list, it’s probably safest not to risk it. Many polishes include silicone. This is great for enhancing shine and reviving glossiness. However, it comes with its downsides. Silicone can leave a residue that’s very hard to remove. Whilst this can make your guitar look better, it can cause problems if your guitar ever needs a repair. Silicone can prevent glue from working properly, making simple repairs much more complicated than they need to be. If you’re going to use a polish with silicone, ensure that it’s used on areas that won’t be affected if your guitar does need any work doing on it. Some polishes are solely suited to gloss finishes, whilst some are suitable for matte guitars as well. Generally, they’re all suited to gloss finishes unless the bottle states otherwise. It’s best to assume that the polish is unsuitable for matte guitars unless it explicitly states that it is. Using a polish that’s not suited to a matte guitar on one can end up giving it its own glossiness. All polishes need to be rubbed in with a cloth or microfibre cloth. Some of the bottles come with spray dispensers, whilst some are poured onto a cloth. Some of them have cloths included, whilst some don’t. Would you rather have something that you can spray on, or pour on to a cloth first? The choice is yours: both are available. In terms of the size of the bottle, think how much polish do you need, and particularly how portable would you like the bottle to be? These bottles range from about 4oz to 12oz. The 4oz bottles offer portability and lightness whilst 12oz will give you better value for money. It will also, of course, depend on how many guitars you are treating, and how often. All-in-one cleaners, or just Polish? If it’s just polish you want, purely for the purpose of reviving shine, or would you like some more treatment? Some polishes work as scratch-removers, some have wax to protect your guitar and some even have UV protection. If you’re likely to benefit from features such as wax protection, it might work out better for you to look for something which isn’t advertised solely as guitar polish. You can get many that are 3-in-1 or at least 2-in-1 products. As well as loving the name and brand, the liquid commonly referred to as ‘spit’ turns out to be very good too. You can use it on metals, plastics, lacquered (including nitrocellulose) and varnished wood. It works as a dust repellent after application and also includes special polymers to protect your guitar from fingerprints and residue. These may contain silicone. It’s easy to apply and remove and comes in a small spray bottle. It uses eco-friendly ingredients that are bio-degradable, non-toxic and safe for a number of surfaces; plastic or metal, as well as wood with any kind of finish. Lizard Spit will be well suited to guitarists with a number of guitars, who would like something that works well as a good all-rounder. It might not be suited to those looking for something purpose-designed to enhance their glossy shine. Can be used on painted, lacquered or varnished wood, as well as metal and plastic. Doubles up as a dust repellent. It’s made of eco-friendly ingredients, so you can use it with a clear conscience. It comes in a very small bottle. We all appreciate the standard of their guitars, so is their polish up to the same standard? You bet it is. 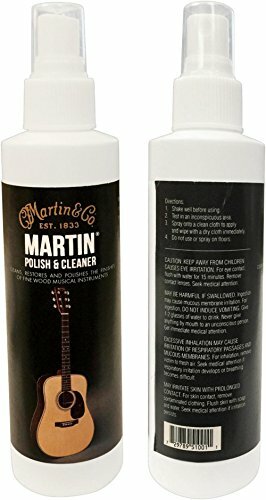 The professional polish by Martin is designed to care for fine wood acoustic guitars and works as a cleaner as well as polish to remove any fingerprints or residue from your guitar’s body. It can be used on the body of either a gloss or matte acoustic guitar and works to restore the natural finish of your instrument. There’s no cloth included, but this liquid can be sprayed onto any cloth (ideally a lint-free one) before being wiped gently across your guitar. It comes in a larger bottle than the Lizard Spit, at 6 oz, but it costs a little more also. This solution from Martin will suit people with fine wood guitars – it’s less suitable for electric guitars. Cleans as well as polishes. Generous 6 fl. oz bottle will last quite a while. Designed specifically for acoustic guitars. It will be less suitable for electric guitars. This guitar polish from Ernie Ball is a superb budget option. Coming with a free microfibre polishing cloth, it’s a non-oily solution that leaves no residue behind. It will be safe on the majority of woods and finishes and comes with a microfibre cloth for ease of application. It’s very quick and easy to apply and remove and the formula is fairly mild, so you don’t need to worry about any adverse impact on your guitar. Like the other polishes, it comes as a spray with a small nozzle to release the liquid. It works solely as a polish, and shouldn’t be used as a general cleaner for strings or frets. 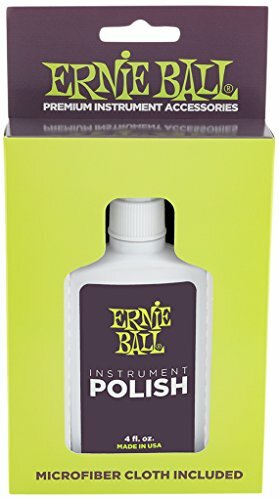 Ernie Ball’s polish will suit people who are looking for a cheap and easy option and are only interested in polishing their instruments. 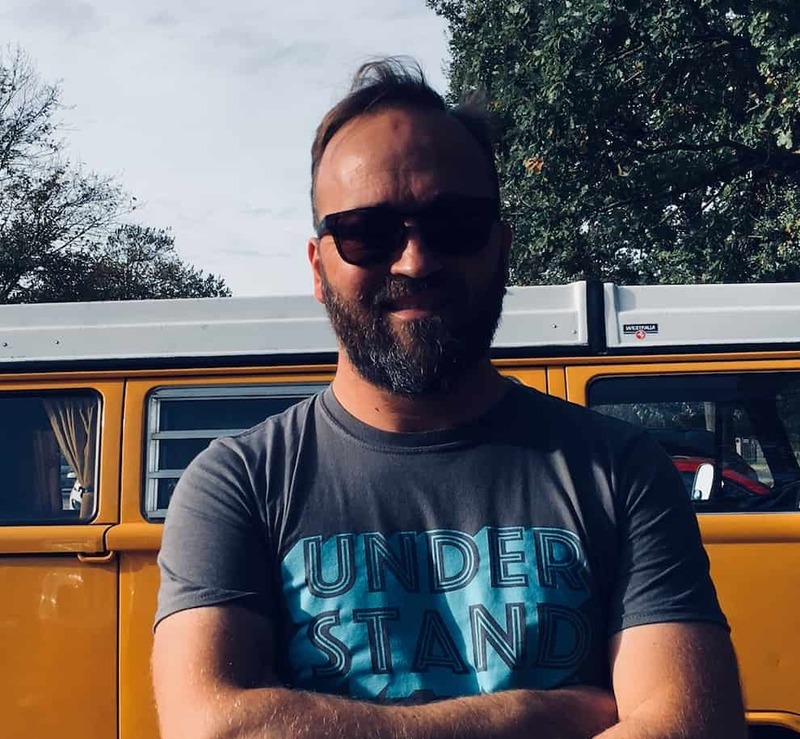 It will be less suited to those looking for maintenance beyond simple polishing. Comes with a microfibre cloth for application. Can also be used for cleaning CDs. The spray bottle feels cheap and can drip a little. The formula is pretty mild. Music Nomad’s MN150 is a 3-in-1 cleaner, polish, and wax. Impressively, beyond these three features, it also includes UV protection against sun damage and is a biodegradable formula. The three-in-one liquid is designed to work with gloss finishes, so it won’t be suitable for matte guitars. The wax might also put some people off, as it can sometimes leave a residue. The solution comes in a small, handy bottle that you can slip into your guitar case. It’s quite expensive but still cheaper than buying all of the separate treatments individually. This liquid will suit the convenience-hunting musician who doesn’t want to compromise quality. It won’t be the right liquid for those with a matte finish, as it’s purpose-designed for gloss. 3-in-1 cleaner, polish and wax. Includes UV protection against sun damage. The formula is biodegradable, and also smells good! It’s only suited to gloss finishes. Dunlop’s guitar maintenance kit contains 5 different bottles, to fully care for your guitar’s body, neck and strings. As well as the 5 liquids, there are also multiple polishing cloths included, as well as instructions to remove any guess-work with regard to the application. The pots included are string conditioner, fingerboard cleaner, body gloss, polish and cleaner and deep conditioner oil. With this set, and a little bit of time set aside, you can be sure your guitar is getting all the care it needs. With good quality comes a matching price, but as a set, it works out a lot cheaper than it would be to buy each of the different bottles individually. The Dunlop 6500 kit will suit guitarists who are eager and able to take the time to thoroughly care for their instrument. It might not be suited to the player who wants a quick and easy option, although none of the 5 contained treatments is difficult to use. Contains 5 different cleaners to fully care for your guitar’s body, neck and strings. Includes instructions, removing any guess-work. It might be a bit overwhelming for somebody who’s just looking to polish their guitar. The fretboard cleaner can dry out the fretboard. 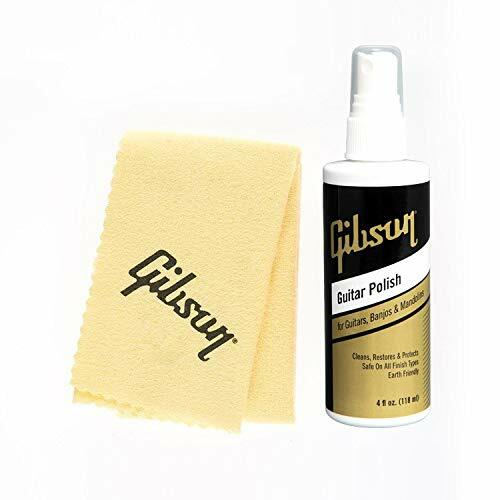 Gibson Gear’s Pump Polish works well with all guitar finishes, whether glossy or matte. It comes with a ‘Gibson’ design cloth, which might win over those who are loyal to the brand and it’s pure and simple polish: created to restore shine and cleanliness. This polish doesn’t double up as wax or cleaner, so it’s best to stick to using it on your guitar’s body. It’s unlikely to do your string or frets any good either. It comes in quite a small bottle, with a spray dispenser that’s reasonably stable and the bottle itself looks stylish, like the cloth. The price is similar to the majority of bottles of guitar treatment. The ingredients are described as ‘Earth-friendly’, so like the Lizard Spit, you can use this with a clear conscience. Gibson’s Pump Polish will suit players of Gibson guitars and beyond. It’s versatile, suiting all guitar finishes equally and it’s perfect for those who want a pure and simple polish without any extra functions. It wouldn’t be ideal for those who did want something that cleans or protects, as well as polishes. Comes with a ‘Gibson’ design cloth. Works well with all guitar finishes. Purpose-designed to keep guitars clean and shiny. Doesn’t double up as wax or cleaner. Player’s Kit’s polish and scratch remover works to bring back shine as well as removing scratches from your instrument. It’s designed to work with glossy guitars and it works to restore the existing finish. It’s not suitable for matte guitars. The scratch remover will neutralize light scratches so that they blend in with the rest of the body, but does so without using harsh chemicals or silicone. It won’t work for deep scratches, though it may make them less noticeable. There’s a microfibre cloth included, for easy application and the kit contains two slightly different blends, which complement each other. When you consider that you’re getting two bottles (plus a cloth) the price is very similar to the other polishes in this list. Those who have high gloss guitars that are prone to light scratches will greatly benefit from Player’s Kit’s polish and scratch remover. It won’t be suitable for those whose guitars aren’t supposed to shine. Doubles up as a scratch remover. Designed for high-gloss finish guitars, to rejuvenate their shine. Unsuitable for guitars with a matte finish. StewMac’s Preservation Polish, like Player’s Kit’s polish, uses no silicone. This makes it guitar-friendly and smudge-free. It gently cleans and polishes your guitar, as well as working to protect lacquer and varnish finishes. It works on both gloss and matte finishes and is perfectly safe for both as it leaves no residue at all. The polish comes in a large, 12-ounce bottle, and a little bit goes a long way. The price is very good value, and it’s easy to apply the liquid with a cloth (not included). There’s no spray dispenser on this bottle, so you’ll need to pour it onto a cloth before rubbing it into your guitar. StewMac’s polish is perfect for those who want something straightforward, clean and versatile, to apply to their guitar’s body without worrying about it. It will be less suited to those who want the ultimate in shininess or require additional features. Silicone-free, so there’ll be no residue or smudging. Suited to both matte and gloss finishes. Comes in a large, 12-ounce bottle. Doesn’t double up as anything more than a polish. As you can see, choosing the right polish for your guitar will depend on what guitar(s) you play, your budget and how much time you have on your hands. 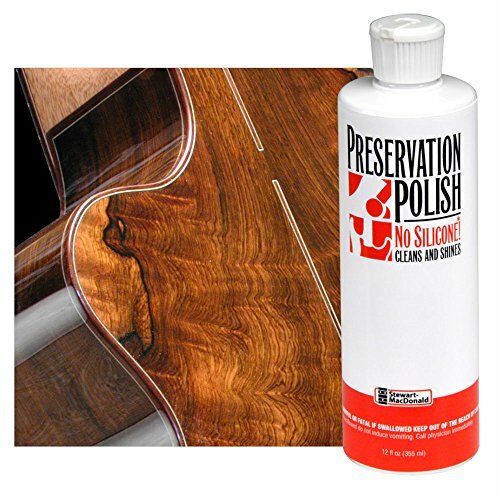 If your instrument has a high-gloss finish, Player’s Kit Polish and Scratch Remover can do an excellent job of restoring your guitar’s original shine as well as removing any surface scratches. If you have a matte guitar, StewMac’s polish, Martin Professional polish or the Gibson Gear bottles will all be safe for your guitar. The StewMac product is very clean and comes in a large bottle, whilst the Martin Professional polish is excellent at bringing out the natural qualities of acoustic bodies’ woods. The Gibson Gear bottle will suit any guitar, so it’s great for those who have several. If you’re looking for something that has multiple functions, Music Nomad’s MN150 works as an all-in-one cleaner, polish and wax. 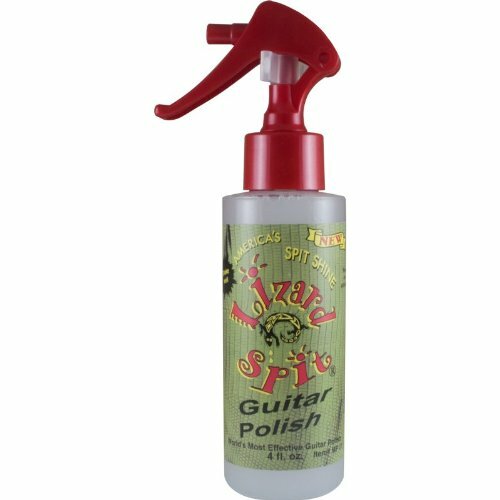 Lizard Spit is also multi-functional, working on plastic or metal as well as woods, and Ernie Ball’s instrument polish doubles up as a CD cleaner. Those who have the time to use five different products to maintain their guitars will rejoice in Dunlop’s guitar maintenance kit. The various bottles will care for each part of your guitar individually. All of the polishes cost a little more than you might expect a small pot of cleaning fluid to cost, but when you consider the amount you’re saving as you prolong the life of your guitar, it’s nothing at all. We hope that our reviews have helped you to find the right treatment for your guitar(s). Shine on!